Because of Love by Shauna V. Brown. 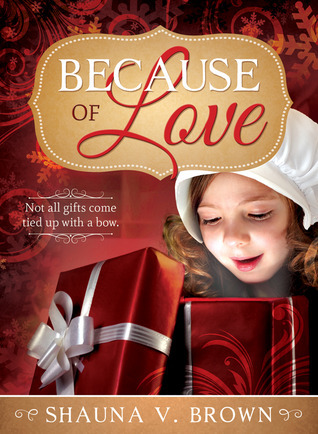 Audience/Genre: Family, Christmas, Historical Fiction, Novella. Publication: October 14th 2014 by Cedar Fort Publishing & Media. Get out your Kleenex. Because of You is one of those tales to lift you up and gives you hope. This is a story of tender mercies. Byron, the dad, was a pioneer who did have to walk in bare feet and has many scars on his feet for it. He wants his children protected and doesn’t want to waste and is frugal. So his family of his wife and three girls owns very durable boots. For the youngest, Josephine, it is way big on her. The other kids make fun of her. Sometimes the older girls too but they just endure it. When their mom catches others singing a mean made-up song, she is angry. She wants her husband to understand that not all scars are physical. The message and what sacrifices are made are so tender; it definitely had me in tears. I had a lot of tears for such a short book! So, if you like short stories with a great Christmas message, families, sacrifice and love than this is for you. It is only 96 pages! “They what?” he asked, sounding surprised. “A stupid song,” said Josephine with a grouse look. “They made up a song about her bony legs and those big boots,” informed Ida. Byron met my eyes. It was easy to see he was upset. He stooped down, picked Josephine up, and held her close. Once again Josephine began to cry, and he comforted her quietly as he thought. “Ida! Stop this at once. You don’t hear your mother complaining, do you?” Byron interrupted, while looking at me intensely. “Your mother and I will discuss it – later,” he said. He must have sensed my displeasure, and his eyes turned sad. We all knew the topic was no longer to be addressed in his presence.